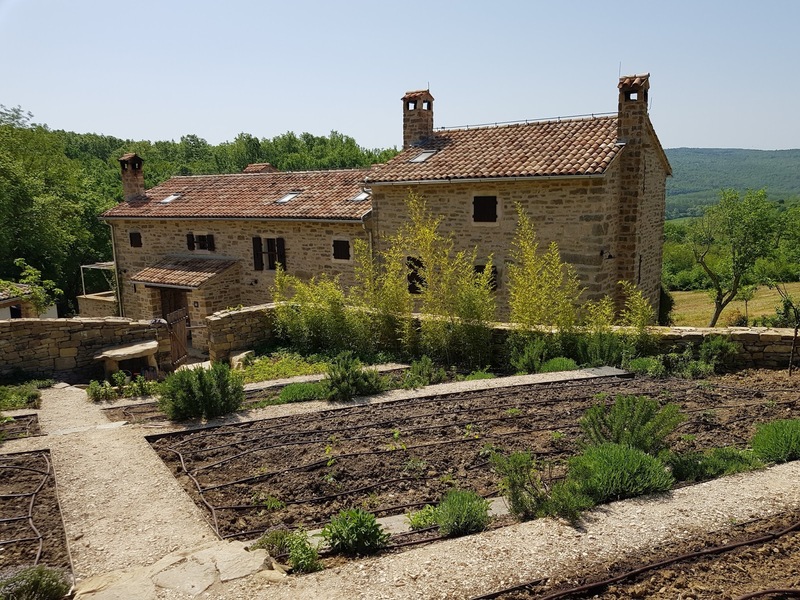 Bolara 60 is a beautiful house in a beautiful setting: it sits up in the hills above the Adriatic coast of Croatia, in Istria, the large peninsula which juts out into the Adriatic Sea just south of the Italian border. 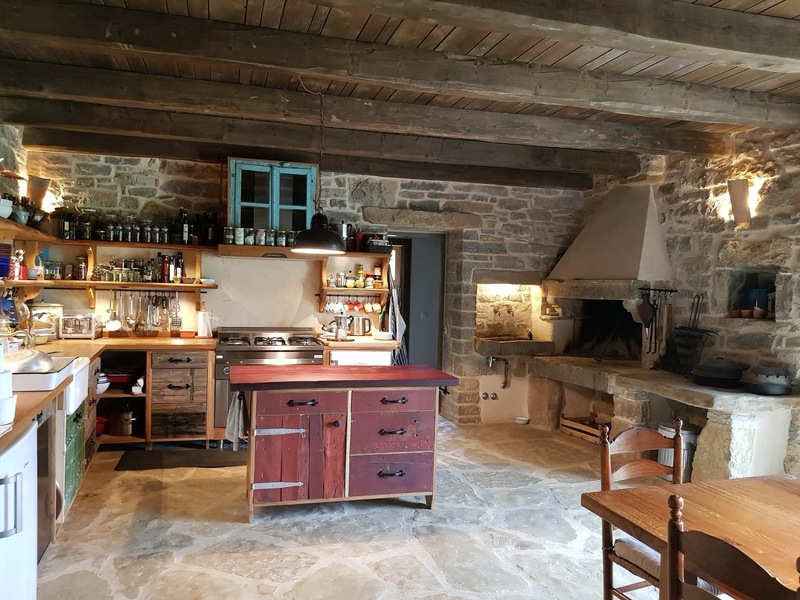 Originally a farmhouse, it has been carefully restored and renovated in traditional local stone and wood and is now a comfortable guesthouse. Sustainable living was an important factor in the restoration: solar panels on the roof heat the water in summer months, rainwater is diverted into an underground aquifer and pumped to taps around the ground for irrigation. 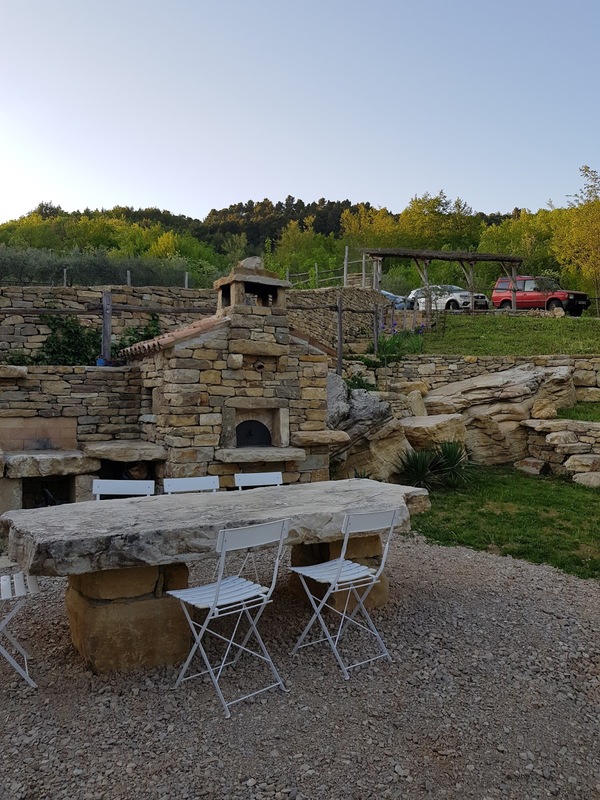 Bolara 60 is owned and run by Anna Colquhoun and Matt Purver as a guesthouse, an ideal base for anyone wanting to explore Istria and Croatia, and to experience the food and drink of the region. Anna is a cooking teacher, food writer, and academic researcher, who ran cookery classes and a supper club in north London as the Culinary Anthropologist for some years before coming out to Istria. Many of the guests come here to expand their food horizons and Anna will give classes and demos to guests on request. 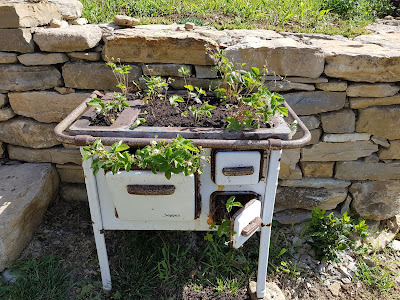 As well as renovating the old farmhouse, Anna and Matt have planted fruit trees in the meadow below the house, and in the main garden, giving them figs, quinces, peaches, grapevines, kiwi fruit - a very popular shade-giving plant in Istria - and sour cherries. 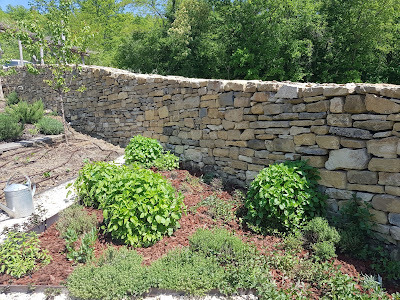 They have also restored the old kitchen garden, abandoned for over 30 years, with a new stone wall boundary and edged beds. Anna invited me to come out to Bolara 60 to work on planning and planting the vegetable garden at the start of the 2018 season. Armed with my best secateurs, a suitcase full of seeds, and Anna's vegetable wishlist, I set off for Bolara 60 via Stansted and Ljubljana for a two-week working stay. The vegetable garden is optimally situated on a south-facing slope. A line of bamboo (still standing among the ruins when Anna and Matt first set eyes on Bolara 60 in 2012) at the foot of the hill soaks up the water that runs down the slope, and provides canes to support beans and other climbing plants. Also here is the strawberry bed, and a separate perennial herbs bed with rosemary, thyme sage, lemon verbena, lemon balm, tarragon, and lovage. The banks are planted up with more rosemary, thyme and sage bushes and also lavender. Globe artichoke plants, apricot and plum trees line the side walls. That leaves six long rhombus-shaped beds for annual vegetables. It's not often that you get a complete blank slate to work on with a vegetable garden. Matt rotovated all the beds, which were then left a few days before being hand-weeded. We - a team comprising Anna, myself and Bolara 60 volunteer Caitriona Courtney - cleared out the beds. Any perennial plant which was taking up valuable space was moved. Two globe artichoke plants were moved to nearer the side walls, where they sulked for a week before deciding to make a go of it and put on new growth. A couple of gooseberry bushes were taken out of the beds and transplanted to a shadier place between the kitchen garden and the house - ten days later, they were already showing tiny incipient fruit. The garden needs to supply the kitchen and a continual houseful of guests, so there was much discussion about which crops to concentrate on. Anna and Matt don't at the moment want to grow potatoes or onions - plenty always available in the local farmers' markets. 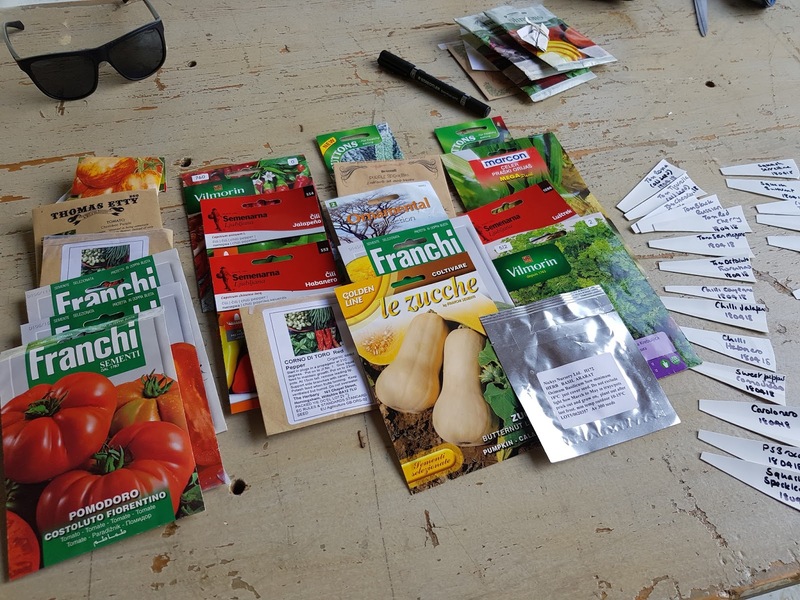 They do however want lots of tomatoes and various beans, from Borlottis to local varieties whose seeds are wrapped in unmarked paper bags. Tomatoes can be made into passata and used throughout the winter months, while the beans can easily be dried and likewise kept for months. So after some mapping and redrawing, we divided the beds into 1) tomatoes, 2) beans, 3) courgettes and cucumbers, 4) lettuces and salad leaves, 5) brassicas and beets, and 6) bitter leaves and roots. 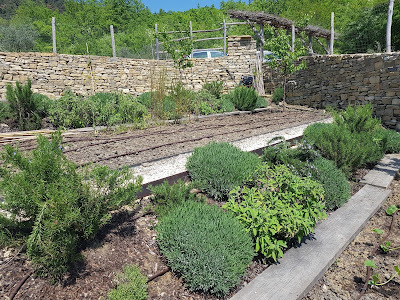 Chillies and aubergines could be planted in the narrow beds set against the south-facing rear wall and benefit from the heat reflected off the stone, and Anna was also keen to grow squashes. Why not train them up the wall to scramble over the top instead of rambling haphazardly over the garden? There was space at the sides to dig out 60cm wide beds and grow the squash here. Melons could go along the side wall as well. Sitting at the long dining table, which comfortably accommodates up to 16 guests in season, we pooled our seed resources. I'd brought with me a selection of Franchi seeds, with their provenance mainly in northern Italy, just over the border 45 minutes away, some old favourites such as my carefully hoarded Turkish rocket and tomatillos, and some that Anna had requested: purple sprouting broccoli, and good eating squash. 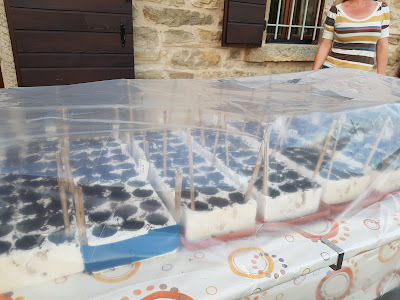 We stocked up on seed-sowing modules from a local agrarija (like Wickes, if only Wickes sold rows and rows of 250ltr vats for making wine, and olive oil presses) and spent a happy afternoon or two sowing 45 varieties of vegetable and constructing a mini-greenhouse from plastic sheeting and split canes. In fact we ended up calling on Caitriona's experience as a trained architect to advise on the design of the mini-greenhouse and her expertise paid off: the mini-greenhouse worked superbly. I miscalculated the adjustment required between a Mediterranean climate (Istria) and a warm temperate one (London). While the squash seeds germinated after about a week and the brassicas in just a few days, as they do in the UK, the salad leaves, sown directly into the open ground, clearly enjoyed the warmth and the irrigation and germinated within 48 hours, Puzzlingly, the tomatoes wouldn't germinate at all. "How is this possible?" I asked. "Tomatoes always germinate." But I had failed to take into account that while the days were very warm, the nights were still cold, and the drop down to 10-12 degrees was too cool for the tomatoes. The tomato modules were brought indoors and seedlings started to appear in the next day or so. Garden centres aren't as plentiful in Istria as in the UK, but the agrarijas sell seedlings in season and are well worth visiting in spring to pick up new stock as it comes in. We found chilli and aubergine plants, local tomato varieties, courgette and watermelon seedlings, which could go straight out into the garden and save a lot of space in the mini-greenhouse. 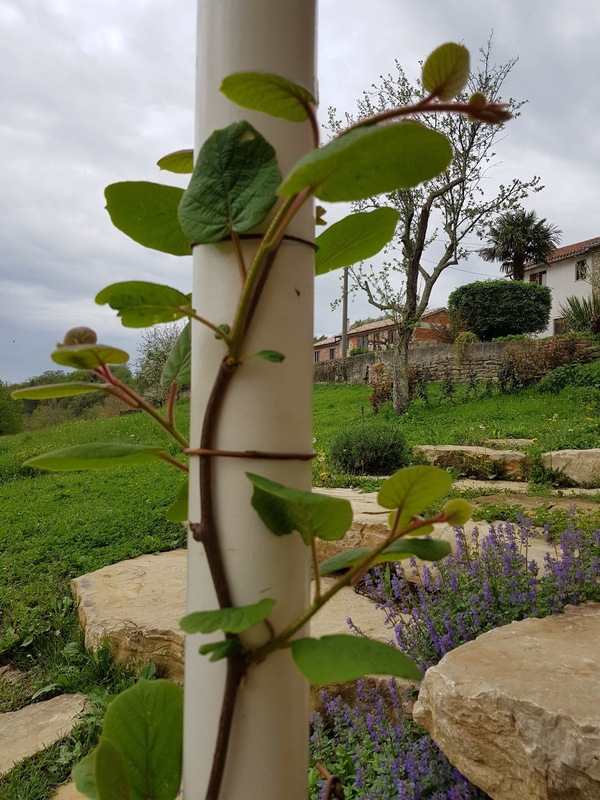 The irrigation lines - essential in this Mediterranean climate where the year's rain falls mostly in winter and spring - were realigned to ensure that all the germinated seedlings and bought plants were getting their fair share. By the end of the fortnight, we felt we'd made good progress. The brassicas were all in, the salad leaves growing apace, and the courgettes, chillies, aubergines and tomateos all well established and putting on good growth. Here's hoping for a bumper season at Bolara 60 this summer - Anna has reported that since I've been back in London, they have had their first batch of strawberries, their first artichoke and there are tiny courgettes already forming. I'm planning to return in October to help with the harvest and to get the garden ready for the winter months. 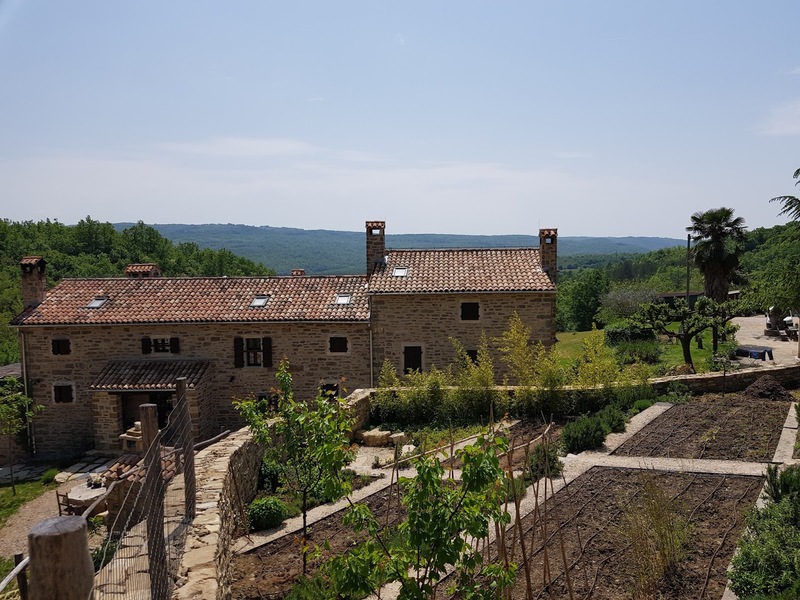 For more details about Bolara 60 and planning a visit, see the website at http://www.bolara60.com/, or for more on this stunning and unspoiled part of Croatia, look up Istria at https://www.visit-croatia.co.uk/croatia-destinations/istria/. 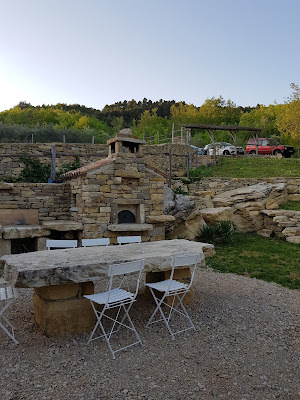 The outdoor grill: the large stone dining table is made from a single slab excavated during the renovation of the main house. Kiwi fruit vine: the large leaves provide welcome shade in summer, and plenty of fruit in the autumn. 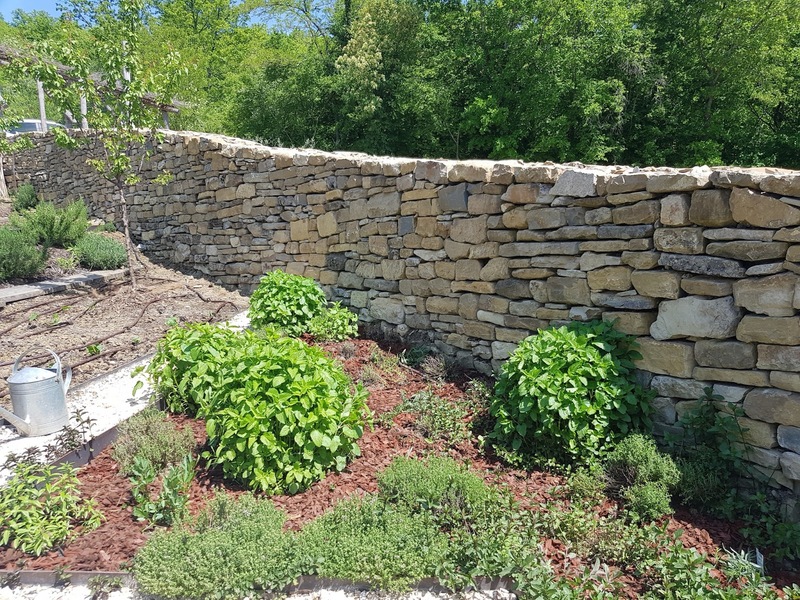 Shrubby herbs planted into the steep banks help to prevent soil erosion with their spreading roots and also attract bees and other beneficial insects int the kitchen garden. 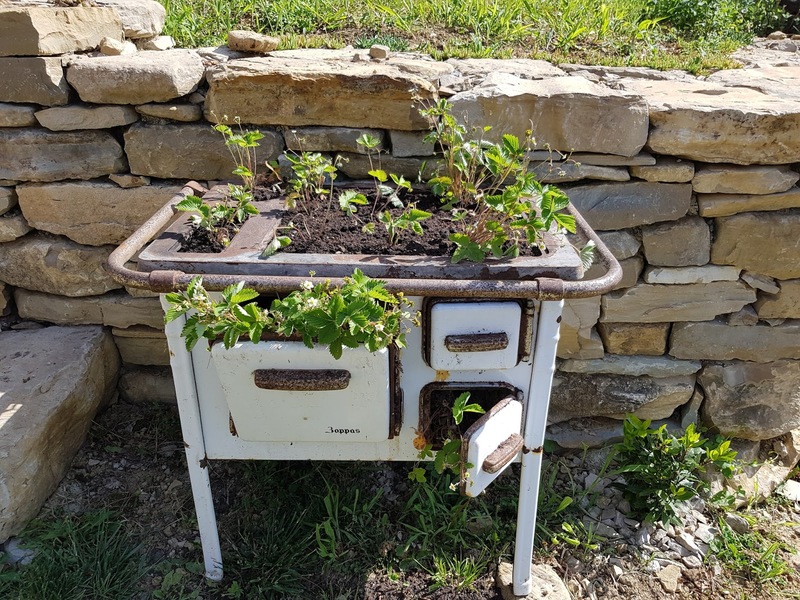 An old wood-fired range, now reborn as a strawberry planter.